Concerned about how the new tax law may impact your health insurance? Confused about what is the right health care coverage for you? Will you be able to deduct medical expenses? What about co-pays, premiums and deductibles. If so, a panel of health insurance experts will be at Pensacola State College this week, Friday, Jan. 12, from 7- 9 p.m. in the Jean and Paul Amos Performance Studio to answer questions and address concerns about health insurance coverage. Admission is free. 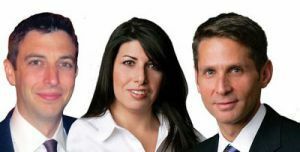 Meet Andrew Rubin, Allison Vogel and Matt Penziner, hosts of “HealthCare Connect” which airs on Sirius Satellite/XM’s Doctor Radio program. Rubin, Vogel and Penziner will guide audience members through the complexities of the current health care system, and answer questions about options available to Florida residents. The hosts who work at New York University’s Langone Medical Center also will answer questions about selecting a health insurance plan, qualifying for subsidies, paying medical bills, copays, premiums and deductibles, and more. Rubin, vice president for Clinical Affairs and Ambulatory Care at Langone Medical Center, is knowledgeable on topics ranging from the controversial national debate over reform to the use of electronic medical records. He is operationally responsible for the NYU Langone Medical Center physician organization (Faculty Group Practice), and oversees more than 1,100 physicians and a budget of almost a billion dollars. Rubin has appeared on CNN, Good Morning America, CBS, Fox News, MSNBC and other networks. Vogel, vice president of Managed Care at Langone Medical Center, brings a unique insurance-oriented perspective to the table. A former insurance executive, Vogel’s 13-year career spans numerous aspects of the health care delivery system. Penziner, senior director of Managed Care and executive director of NYUPN-Clinically Integrated Networks is responsible for all payer relations, physician contracts and credentialing information and has operational oversight of new health care reform initiatives, including shared savings and accountable care models. Hosted by WSRE-TV, as a special edition of the “Aware” show. Seating for “HealthCare Connect” is free but reservations are required. Doors open at 6:30 p.m. Call (850)484-1759 to reserve a seat.